We begin the series with self proclaimed flag geek Peter Ansoff, president of the American Vexillological Association (NAVA). He shares tips on how to make an effective flag, and why flags endure as symbols for causes and groups across history. We all know the photo: It captures the rage, division and the racial tension from 40 years ago that is still so present now in our country. Titled "The Soiling of Old Glory," the photo won a Pulitzer Prize for breaking news photography. Stanley Forman took the picture on April 5, 1976, for what was then the Boston Herald American. "For the time (it) has everything you want in the picture," says Forman. If you've seen the picture, it's hard to forget. 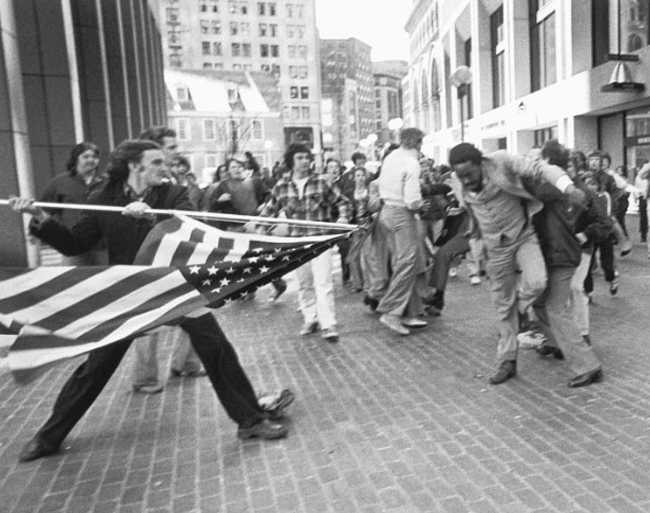 A young, white man lunges at a black man with the sharp point of a flagpole, with the American flag attached.